The city of Sanford is the seat of Florida’s Seminole County, and known as the “Historic Waterfront Gateway City” due to its prominent location along the shores of Lake Monroe and St. Johns River. For its over 58,000 residents, Sanford offers numerous outdoor events throughout the year, including a variety of green initiatives and other city improvement efforts. You can do your part by improving the living environment in your own home! Sanford Neighbors & Friends: I bet you have never heard of Rotovac 360i, have you? If so, get ready to experience the new “Wow” factor in carpet cleaning in Sanford, FL. Most companies use the “old fashioned wand” for steam cleaning carpets, but we don’t. 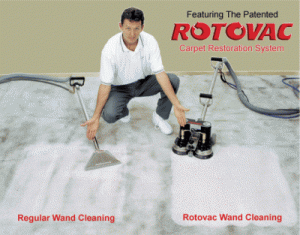 We have found the patented Rotovac 360i to be the best carpet cleaning equipment on the market. It has spinning action that cleans carpets in many different directions, as the head rotates several hundred times per minute. It amazes me even to this day. In fact, we often hear that it got out tough stains that other carpet cleaners couldn’t because they were using the wand! My goal is to make you – a Sanford homeowner – a client for life, so please check us out and give us a try. You will be absolutely delighted with our quality cleaning, competitive pricing, and exclusive no-risk guarantee. Customer satisfaction is our top priority, which is why you can stop us in the middle of our job if you are unhappy. However, rest assured that our reputation is flawless, and we have the Before and After pictures and Testimonials to prove it. Would you like to see our definition of “best carpet cleaning” in Sanford, FL? Please don’t hesitate to call (386) 860-2202 today for a free consultation and estimate. I look forward to working with you!